UC Davis Health Vice Chancellor and Dean Julie Freischlag on Thursday, Sept. 17, shared the successes of the Behavioral Health Center of Excellence at UC Davis at the annual meeting of the Association of Academic Health Centers (AAHC) in Atlanta, Ga.
“UC Davis is advancing care for psychiatric illnesses across the state and nation through partnerships with legislative leaders, funders and other stakeholders, to bridge the divide between transformative neuroscience research, public policy and mental-health treatments,” Freischlag told the audience of national academic health leaders. Freischlag’s presentation highlighted the crucial long-term relationship-building with legislators that led to the establishment of the Behavioral Health Center of Excellence at UC Davis, which was launched, with a sister center at UCLA, in October 2014 through funding from the state’s Mental Health Services Act. The centers seek to advance mental-health research and policy in the state and nation. Hosted at UC Davis the first statewide prevention and early intervention symposium with UCLA, coincidentally also in Sept. 17. 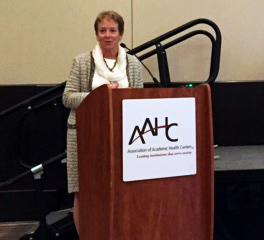 At the AAHC annual meeting, Freischlag also shared the importance of finding a common vision and shared understanding when developing relationships with legislative leaders. “Our shared vision is defining strategies that will revolutionize care to prevent or intervene early in the disease process to avert long-term illness in people with serious psychiatric disorders,” she said. The Association of Academic Health Centers seeks to advance the nation's health and well-being through vigorous leadership of the nation’s academic health centers. Its mission is to improve the nation's health care system by mobilizing and enhancing the strengths and resources of the academic health center enterprise in health professions education, patient care, and research.